House hunting has gone high tech in North Texas. Hundreds of real estate agents are turning to smartphone technology to give potential home buyers information about the property and the neighborhood. 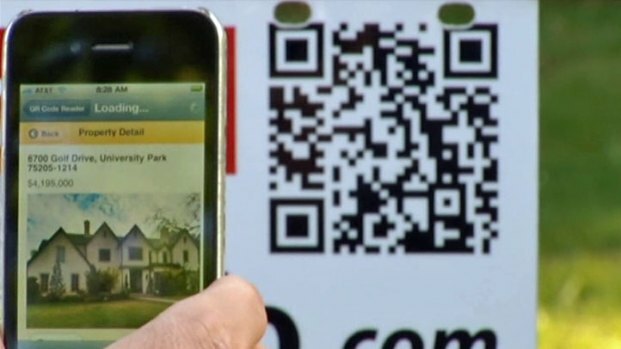 A new type of "for sale" and "for lease" signs bear a quick-response code that can be scanned with some smartphones, including iPhones. Users just hold their phones up to the code and snap a picture. Photos and all sorts of information about the home, from how many bedrooms and baths to school district data, then pop up on the phone. Realtors are using quick response codes on for sale signs to help speed up the home buying process. House hunters can also contact the property's unique email address to get the same information within seconds. Later, they are sent email alerts about price reductions and open-house events. "A lot of people see them and say, 'What's this goofy little bar code?'" said Max Knake, president of Dallas-based EFastinfo. "We're going through a paradigm shift in the way shoppers access information." Real estate agents say that pulling an informational flier out of a tube attached to a "for sale" sign is becoming a thing of the past. "If I drive around and I grab a piece of paper, I'm going to lose it or it's going to get thrown away, versus if I have that information down on an email, then I can file it," said Alex Trusler, real estate agent and senior vice president of Allie Beth Allman & Associates. More than 400 real estate agents in the Dallas-Fort Worth area and Austin are using EFastinfo, which is free to people searching for homes. The technology is spreading beyond Texas. Soon, EFastinfo will show up in cities across the nation. The service has gotten 9,000 hits so far.